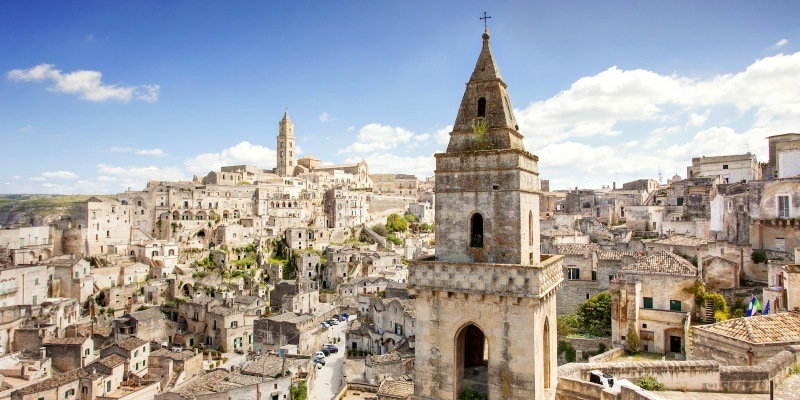 Matera has gained international fame for its ancient town, the "Sassi di Matera" (meaning "stones of Matera"), reason enough for a visit to Basilicata. 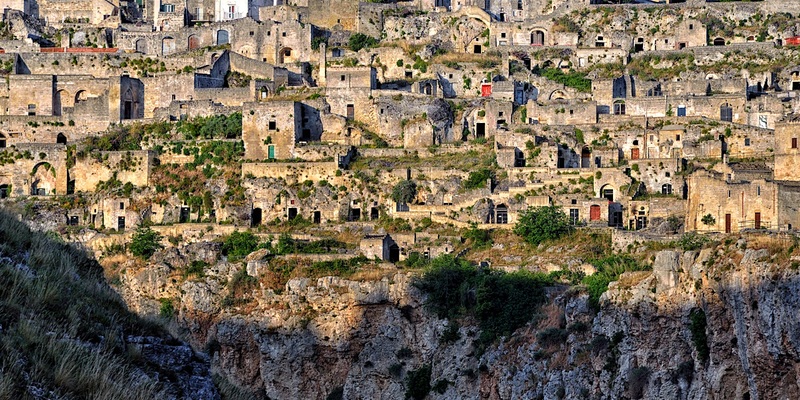 Listed as a UNESCO World Heritage Site since 1993, the Sassi are houses stacked one on top of the other (similarly to terraced vineyards, for example) and linked by tiny, narrow streets and wide stairways. Inhabited since Antiquity and up until the last century, they feature brickwork facades, while the interiors are entirely dug into the rock. The word Sassi refers to, in this case, “inhabited rock districts,” used since the Middle Ages to indicate the two districts that rose up around the original ancient city, the Civita. It occupies the two karstic basins that overlook the precipices of the Gravina Valley: the Sasso Barisano and the Sasso Caveoso. Apart from the houses, the architectural landscape spans a number of churches, themselves dug into the rocks as well. The little rupestrian Church of Santa Lucia delle Malve, founded by a Benedictine community around the 8th Century, is worth a visit, as well as the Church of the Madonna of Idris, leading to the crypt of San Giovanni in Monterrone, or the four rupestrian churches of the Convicinio of Sant'Antonio. The Sasso Barisano hosts the Church of San Pietro Barisano, one of the principle churches of Matera; the Church of Madonna delle Virtù, part of a very ancient monastery;and the Church of Sant'Agostino, built in 1591 in the Baroque. Matera's Romanesque Duomo was built in 1268-70. Palazzo Lanfranchi, rather, harks back to the city's 17th-Century architecture, while various museums include the Domenico Ridola National Archaeological Museum, the National Museum of Medieval and Modern Art, and the Museum of Contemporary Sculpture of Matera (MUSMA). The Archaeological Historical and Natural Park of the Rupestrian Churches of the Materano can be found in Matera's environs, exhibiting more than 160 rupestrian churches, three Neolithic villages (Serra d'Alto, Timmari and Murgia Timone), and many prehistoric tombs. 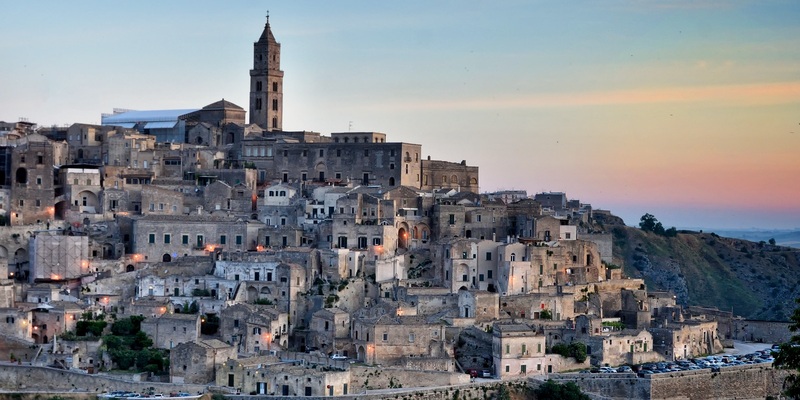 In the southeastern area of Matera lie many beautiful towns like Montescaglioso, with its wonderful Abbey of San Michele Arcangelo; Miglionico, with its Castle of Malconsiglio; Bernalda, with its 15th-Century castle. Finally, Tricarico, Grassano, Irsina and Ferrandina are all abundant with monuments to see. Moving further south, we reach the suggestive Calanchi (Badlands) area, with white clay hills, pinnacles, cones and small canyons carved by sun and rain. In this area the, uninhabited village of Craco is quite intriguing, with numerous historical places, including a castle and a group of houses on the rock, with tiny, stairs and small piazzas behind. 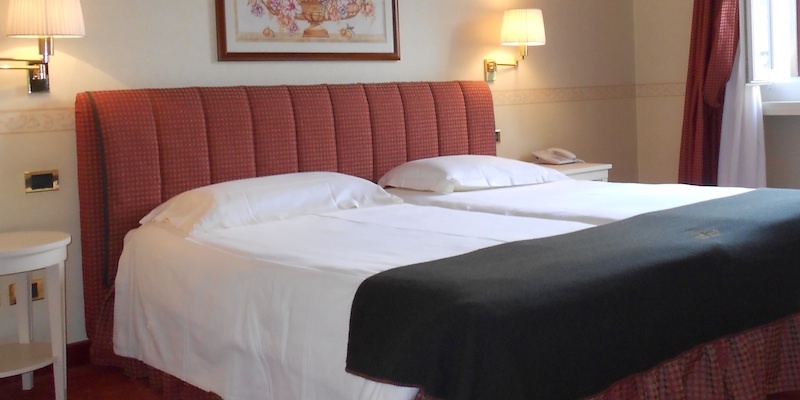 Continuing on the tour, we find the village of Tursi, with its Rabatana district, the ruins of the Castle and the church of Santa Maria Maggiore of Rabatana, and the Church of Santa Maria d'Anglona nearby. The coast fronting the Ionic Sea, the only plains area of the Province, is rich in archaeological ruins, given that it was one of the main centers of Magna Graecia. In particular, the archaeological area of Metaponto deserves a visit, with ruins that include the temple in Doric-archaic style, dedicated to the goddess Hera, called Tavole Palatine; the Temple of Apollo in Doric style; the Ionic temple dedicated to Aphrodite, built around 470 B.C,; the ancient agora and theatre; and the National Archaeological Museum of Metaponto, a trove boasting many more archaeological finds. The last stop is Policoro, with its Castle, Archaeological Park with yet more Greek ruins, and the National Museum of Siritide.